Over 40 of CitySmart’s partners and key stakeholders gathered on 21 October for a private audience with Alison Smith, General Manager of Corporate Affairs at Echo Entertainment Group. The Echo Entertainment Group is part of the Destination Brisbane Consortium leading the development of the proposed Queen’s Wharf Brisbane precinct. With the new precinct due to be completed by 2022, Alison presented CitySmart Partners and guests with a number of exciting opportunities that this development holds for business and industry in Queensland. The Queen’s Wharf Brisbane precinct is set to deliver transformational impacts on the Queensland economy through job creation, training and tourism and heavily supports Brisbane’s vison as Australia’s New World City. 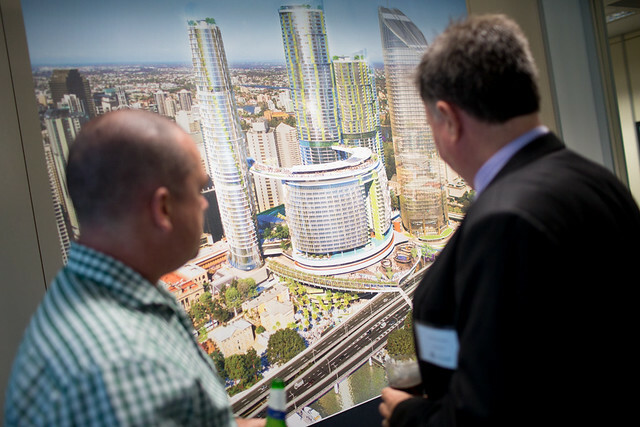 With sustainability at the core of the development, Destination Brisbane Consortium’s aspiration is for a 6 Star Rating, and the consortium is working with the Green Buildings Council of Australia. Developers are also considering a centralised cooling system which holds many opportunities for the CBD Smart Energy project which CitySmart is assisting Cofely GDF Suez and Ventia (formerly Thiess services) to develop. As the Queen’s Wharf Brisbane precinct unfolds, CitySmart will continue to provide partners and stakeholders with key insights into the economic and environmental opportunities available. © Destination Brisbane Consortium. All rights reserved. Artist’s impression. Subject to planning approvals.